After that second race, running officially hooked me. The race-day atmosphere, the rush after finishing a race, the feeling of achievement as my pace increased – all clearly positive. I set a couple of goals that, at any other time in my life, would probably have seemed flat out insane. First, I decided I would continue running outside, through the snow and sleet, on slushy paths and ice, and make myself into a winter runner. Second, I decided to run races on a regular basis – so I committed to run, at minimum, one race per month for a full year. Undertaking that goal established that running had somehow become the dominant activity in my life, and had changed my life, hopefully for the better. The winter-running guidelines I'd come across had recommended focusing on distance, not time, and taking it easy in deteriorating conditions. I slowly increased my distances to the point where running slightly longer races felt possible, and in a December far warmer than the norm, I ran my third race, my first longer than a 5K, the Rudolph Ramble 8K. Winter finally hit in mid-January, and I managed to fight through it. Despite being scared that I'd ran twice in snow to that point, and never with accumulation, I ran a race in wintry conditions for the first time, the Polar Dash 10K. February's Cupid’s Chase 5K came on one of the coldest days I ran all year, with four to six inches of snow on the ground. Along with Mary, I ran the Shamrock Shuffle, Chicago’s second-largest race, in March. She had come into town for the race though, and we ran together. I went along at her pace, not a great deal off my own, until the final half-mile, when, to see how quickly I could boogie, and with her permission, I bolted to the finish. I ended with a time of 48:20, only a marginal improvement from the Rudolph Ramble, but accompanying Mary had felt more important, and it was nice to not have to only run into her at the end. I went into the Wrigley Start Early 10K in late April hoping for a personal record, around a 10-minute mile pace, but didn't honestly expect massive improvement. The course was identical to that of the Polar Dash 10K from three months earlier, and the conditions were sure to be better. I kicked up my effort at the end, telling myself I could hurt later, and went as hard as possible for a good portion of the race. I recorded a time of 59:32, a sub-60 time, and a pace of 9:36 per mile. What's more, I absolutely obliterated my previous time, improving by 7 minutes and 47 seconds from 3 months previously. I felt ecstatic. So far, that's been one of the proudest moments of success I've experienced. I started thinking about weight loss more intensely in the spring, and I started losing again, and I did it how I always had, though a view of weight loss at that time meant eating less and beating the living crap out of my body as often as I could manage. The problem was that during in those periods of loss, I usually felt somewhere between somewhat and wholeheartedly awful. Though hard to admit, I had been lazy for the first year of my weight-loss progress. I had chosen to focus on exercise and running, which I could feel proud of. Simultaneously, I had completely slacked off from focusing on diet. Because I viewed diet as a simple calculation of calorie intake and output – I HATED math, and refused to figure out portion sizes and calorie contents – taking significant action to improve the diet had, until this point, felt impossible. More importantly, I had been ignorant of the complexities behind improving a diet. I ate too much of the wrong foods at the wrong times and had no clue how to recognize my mistakes. A simple, incredibly challenging decision, the foundations of which I took from reading Matt Fitzgerald's Racing Weight, stood at the center of dropping weight so quickly – I took active and complete control of my diet in a healthy manner for the first time in my life. I had complained to Mary that my running times had not improved quickly enough for my tastes, and she recommended that I read that book. I didn’t correlate how my weight could impede my running performance; she told me it had helped her understand many basic truths about food, and imparted powerful advice about diet improvement, while tying its lessons to endurance exercise. Laid out in understandable terms, the lessons from Racing Weight completely changed my outlook on food and diet, and helped me begin to get back on a successful weight-loss track. Certain ideas rocked me and informed how to correctly think about food; for the first time, I found myself able to consider the quality of the foods I ate along the guidelines found in the book and to make wiser decisions in choosing what to eat. I began trying to incorporate more fruits into my diet, whereas before I had eaten very few, and transitioning my meals away from cheap, near-instant-made hamburgers from McDonald's or Burger King and hot dogs from convenience stores. On those days when I completely fell off the wagon – and there were more than one or two – I'd get seriously discouraged and stop documenting altogether. The next day, I'd try to get myself under control and do my best to eat smarter. Despite running and weight loss successes, some challenges mounted, particularly with foot and leg issues, and I did the best I could. 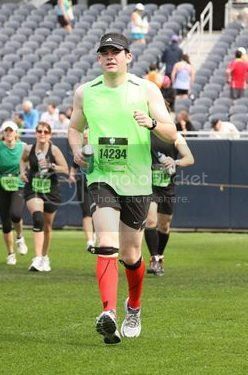 Memorial Day weekend, I ran the Soldier Field 10-Miler, which felt like a serious trial. I learned the perils of mistiming and misjudging water and carbohydrate consumption. I stopped four times, walking a few blocks near the end, and considered giving up. I didn't, and finished as best as I could. Immediately afterward, I came to the most disappointing conclusion related to fitness in quite a while: between knee issues and an impending hernia surgery, I probably wouldn't have it in me to run the half marathon I had registered for in July. As I write this, I find it difficult to stay positive about my chances to run that longer-distance race. In spite of short-term disappointments, I need to force myself to keep an eye on the long-term goals and outcomes. I've made some serious progress, and while hopefully down the line I can run a half, or even a full marathon, running is, to some degree, a means to an end. It supports and makes possible my goals of getting fit and staying healthy for my whole life. I'm determined to reach a point of better health so my back doesn't hurt all day and all night; so I enjoy looking at pictures of myself again; so I don't lose my feet from diabetes; so I can live on my own when I'm older; so I don't get winded running up stairs; so I don't die from a heart attack by 30, amongst other reasons. First of all, accept that you would like to make a change. Identify the exact reasons why you want to make a change and focus on them as often and as intently as possible. Ask yourself – is what I'm doing at this moment contributing to my goals? Put signs up in your home to that effect. That might seem dumb, but it will motivate you. Be honest with yourself. It is possible to change your habits and your lifestyle – but it will be challenging. Chances are, a significant change will have to be made, and it will frustrate you. It will probably hurt at times, and you'll probably hate it sometimes, but in the end, it will also almost certainly be worth it. Take measurements and pictures before you start. It might feel depressing to have to record certain metrics like body fat or weight, or even take full-body pictures, but you’ll regret not having them later. Weigh yourself in similar conditions consistently. Once you get going, carefully document the changes. Don't be shy about telling people that you’re starting to take fitness seriously – the more people who know about what you’re up to, the more who can hold you accountable and support you. 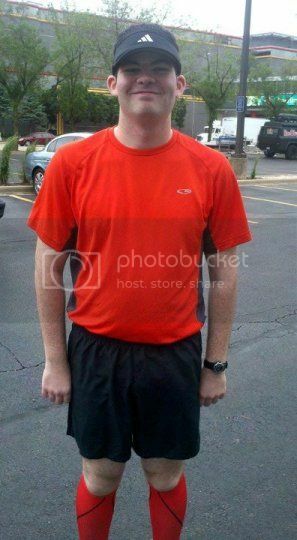 Certain online groups helped me a lot, particularly Reddit, which has weight-loss, fitness, motivation, running, and C25K interest pages. I've heard that blogging can be a good tool for some. You might be surprised where you may find support if you only search a bit. Don't get overwhelmed by the tasks that you face down the line – think of it day to day. Make simple choices continually and stay grounded. Don’t get discouraged if progress is slow, or takes time – and stay realistic. I wanted to lose 100 pounds in a year. For me, that wasn't realistic, which made me mad at first, but it probably would've been dangerously unhealthy! Instead, I made steady, continued, and most importantly, sustainable progress. That should be your goal, too. Prepare for positive and unexpected things to happen down the line, and embrace the change. The first time someone told me I’d inspired them to run, I wrote it off as politeness. By the time five people who didn't know each other all said the same thing to me, I realized I had actually begun to inspire others to exercise. That felt incredible. You can set an amazing example for those around you, and can change others' lives by changing yours. Return the favor that others did for you when you were getting started by supporting as many other people as you can. Thank you for sharing your story with us Matt! It's been great to read along about your struggles and triumphs. Best of luck as you look forward to the rest of your life. And thank you again, for inspiring me to give running another try. I've enjoyed reading all about you, Matt! Thanks for sharing your story! Awesome Job!!!! I'm sure you have heard of Jeff Galloway by now, but his method is great for injury prevention! It's hard to wrap your mind around walking breaks I find, especially when you know you have ran x number of miles before. I loved reading your story, thank you for sharing. I am a night shift nurse and totally understand the social life and fitness trials of working nights and sleeping days! I was also a relief night auditor for Days Inn and was shocked at the ability to move up in the hotel industry. Can't wait to rad all about your journey to a half or full! Loved this "series"! I have slacked off on my weight loss and training scedule and this really inspired me to get back at it :) THANKS!!! Thanks Matt for sharing your amazing story! I've just read all the parts back to back and was instantly hooked. Good luck with future challenges that come your way and I hope to read a lot more from you too! Who is that guy? Wow! Amazing dedication and transformation! Awesome, Matt - thanks for taking the time to share your story - Mary thanks for posting this! Thanks Matt, congratulations on your journey so far, I really look up to people like you and Mary and I wish you guys all the best! Thank you for sharing your story. You've done such an amazing job! i hope you decide to start a blog so we can continue to follow you along your journey.